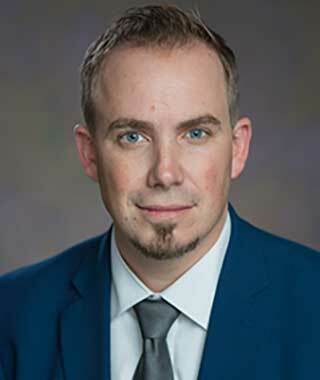 Attorney Travis Meyer is a graduate of Western Michigan University (2008), and thereafter he graduated from Thomas M. Cooley Law School on an academic scholarship with a focus in litigation. During law school, Travis clerked for Ronald Lowe, Chief Judge of the 35th District Court, serving the Judge in a ground-breaking youth court wherein high school students accused of minor crimes and offenses were tried and sentenced by a jury of their peers. Travis volunteered at the Washtenaw County Friend of the Court, and served as a student attorney litigating for the Wayne County Prosecutor’s Office. Before coming to the firm, Travis worked in personal injury with a Detroit metro firm and managed a private practice serving his clients in civil and criminal litigation. An accident victim himself, Travis has a special understanding of the needs and challenges his clients face. While traveling home from vacation with his family in 2016, his car was rear-ended on the interstate by a drunk driver in another state resulting in injuries and a totaled vehicle. This experience has solidified his passion to serve those suffering from personal injury and loss. Travis spends his free time enjoying Michigan’s great outdoors while hunting, camping, and traveling with his family and friends. He is also a volunteer head coach for NFL Michigan Youth Flag Football grades 2-3.